The German sextet fronted by singer Jennifer Haben started their journey in 2014 and this is their 3rd full-length album. In summer 2016 Jennifer Haben and the band parted ways, but soon Jennifer gathered some talented musicians who shared her vision and so they  started working on album No. 3! Full force they start with Hysteria, a symphonic metal tune based on heavy riffs and Jennifer Haben's powerful vocals. And within seconds they drag you into their musical universe! They offer sing along passages, powerful guitar-driven parts and symphonic elements. For the title track they ease of a bit and add some slower passages. But you can check out this one yourself! Keyboard and vocals take you into Through The Mirror, a song with a melancholy note. They switch between slow passages and powerful parts again. Male vocals take you into Million Lightyears. Then Jennifer takes over. This one is extremely catchy and even if they stick to their guns, it sticks out. At Song For The Godless they present a mid-paced tune with a dash of folk woven in, but also a part where the guitarists can shine. At Escape From The Earth the band stays in the background and gives Jennifer the chance to show her fragile side. A bombastic symphonic track with big choirs is Beneath The Blackened Sky leads into the second half of this album. About Fairytale Of Doom one might say: same, same but different. 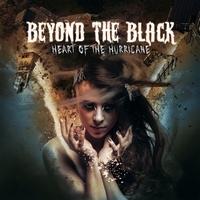 It's another symphonic metal tune, but while Beneath The Blackened Sky had a dark edge, this one has a positive vibe. And once again a neo-classical inspired guitar solo is embedded. One of my faves is Dear Death, a song with all ingredients of the Beyond The Black sound and actually I can't name what makes this one special for me. Perhaps it's just the vocal line which hooks me up more than any other. I have no clue. And at the end of the day it doesn't matter what hooks you up and why you listen to this album - again and again. Just give it the chance and let the magic do the rest.